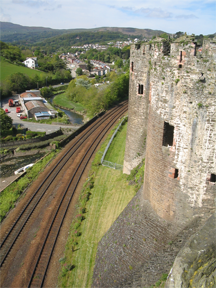 A section of the walls of Conwy Castle showing, in the foreground, a battered plinth. A plinth is a base course of stones or brick in a foundation. A battered plinth is a plinth with an upward slope receding towards the center of its wall. Battered plinths served multiple purposes. In some cases, though not at this particular point, they degraded the effectiveness of battering rams by causing the rams to deflect upward. Battered plinths also provided a ricochet surface, causing missiles dropped from above to deflect horizontally and strike attackers and their siege machines. But most important, battered plinths increase wall stability and enhance their resistance to undermining attempts by attackers. Undermining subordinates is usually rather easy to do, until your subordinates recognize the pattern. Once they do, they build the equivalent of battered plinths. For instance, secret leaders might take it upon themselves to announce their appointments. Their peers, knowing that the boss tends to appoint secret leaders, are more kindly disposed to such behavior, which might otherwise be viewed as usurpation of the boss's prerogatives. Or knowing that the boss tends to dawdle when asked for approvals, the subordinates might counter by asking for approvals far earlier than they would with a less undermining boss. For every measure the boss elects to use, there is a countermeasure. Photo (cc) David Benbennick. Undermining one's own subordinates might seem at first to be a dumb thing to do. Well, it is. But that doesn't stop people from wanting to do it even more effectively. Here's a collection of techniques for undermining your subordinates. If these seem like common sense to you, you probably need professional help. "Sit in," unexpectedly if possible, on meetings usually conducted by subordinates. About one-third of the way through, make a very-important-sounding pronouncement that lets you hijack the meeting for whatever time remains. Drop in unannounced on your subordinate's subordinates. Ask probing questions that suggest you have doubts about your subordinate's performance. Example: "What's the real scoop on this project?" Make them co-leaders of something that's in such disarray that only a single, strong leader could ever prevent the looming failure. Delegate something to A, then re-delegate it to B, without telling A that you re-delegated it. For extra zing, don't reveal to B that you had previously delegated it to A. Delegate something to someone, then un-delegate it, but don't explain why. Let everybody think that the un-delegatee must have messed up, but never say why or how. They'll imagine things far worse than anything you could possibly think of. Tell someone they're responsible for leading something, but don't tell anybody else. If somebody else asks you to confirm that the designated leader is actually the leader, mumble something incoherent or at least ambiguous. Never hold a team responsible for failure, because they'll just support each other, mitigating any guilt or shame. Make sure you single out just one person. Shame is more intense when borne alone. Public humiliation is always effective, but don't overuse it. Use sparingly for maximum sting. professional helpis hiring, insist on interviewing all candidates. Also insist on final approval. And make sure that everyone knows this is your policy. You don't want anyone getting a sense of autonomy, because autonomy is good for self-esteem. Every now and then, override a subordinate's decision. Naturally, wait until after the decision has been publicly announced. Take your own sweet time when someone needs your approval for something. When you finally do approve, they'll really appreciate it. Oh, and turn something down occasionally. You don't want to be seen as a rubber stamp. Practice these words: "I think we need to re-think this one." Would you like to see your comments posted here? rbrenRHOOryqxBMQHCeVoner@ChacPmslyHfgfNFVUFDWoCanyon.comSend me your comments by email, or by Web form. When an internal department or an external vendor is charged with managing information about a large project, a conflict of interest can develop. That conflict presents opportunities for unethical behavior. What's the nature of that conflict, and what ethical breaches can occur? I offer email and telephone coaching at both corporate and individual rates. Contact Rick for details at rbrenlqYRmeaoQPRRiPvmner@ChacPccEFIjbVYlARrpQoCanyon.com or (650) 787-6475, or toll-free in the continental US at (866) 378-5470.